Like to go against the grain? Try stepping onstage with a BassLab STD. I did, and the instrument´s radical design inspired all sorts of strange looks and bandmate comments at a funk gig. With its long, curved horns and ballooning body bouts, the BassLab STD truly looks like no other bass,but it´s also built like no other. BassLab handbuilds each bass from a resin, carbon-fiber, and secret-ingredient composite, adjusting the ingredients´ ratio for each instrument´s desired acoustic quality. According to BassLab, the one-piece body also maximizes energy transfer from the string, allowing for bass-body resonance to play a greater part in tone generation. Constructed of molded composite, the STD is a one-piece instrument that´s completely hollow, even along the length of the neck. Heiko Hoepfinger, a German musician, physicist, and former acoustics consultant, bases his hollow composite BassLab designs on the idea that using acoustically tuned synthetic materials maximizes both resonance and string-energy transfer into the instrument body. With the STD, his main goals were to enhance clarity, sustain, and frequency response while providing good acoustic and ergonomic qualities. Though the STD´s resulting visual aesthetic suggests strange science and a cold, metallic future, the musical result tends more toward a rootsy, acoustic sound, with some distinctive characteristics. Hoepfinger placed the BassLab´s strap buttons in a position that encourages the headless neck to hang more vertically, allowing the fretting-hand wrist to be straighter. The curved body forms an easy armrest for the plucking hand. Additional gig-worthy elements include light weight and easy balance, a passive/active switch, and quick-change battery compartment,though I found the plastic compartment tough to open without tools. Three pickups and sweepable mid EQ promise sonic versatility, and the curved placement of the five knobs make them easy to reach. Despite the looks I received when I stepped onstage, no one questioned how good the STD sounded. Having previously found mostly resonant, big-bottom tones and a markedly nasal bridge-pickup sound, I combined the bridge and middle pickups and added low mids for a good all-around, meaty gig tone that sat well with the kick drum and spoke well in the house with an Aguilar DB 750 and GS 410 cab. The BassLab has a distinctive attack with a sharp, articulate punch followed by an airy warmth as the note blossoms with plenty of sustain. Another staffer got a favorite tone using the two neck pickups, which accentuate the STD´s natural warmth and huge bottom end, but bandmates complained that the bass lacked presence. He also suffered feedback, but even at high volumes I never had that problem. 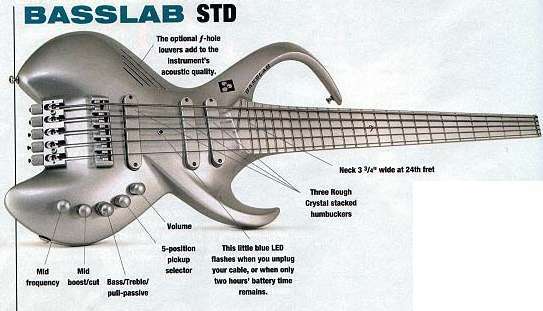 The BassLab STD is a lively-sounding instrument with a variety of sounds. It excels at round, resonant tones that would be great for rootsy or small jazz settings. Just be sure it matches your tux! Media, Inc. All rights reserved.